Do you have any fave quotes of autumn? Very cool autumn-y art, Athena! Gramma had a cat named Autumn that the peeps inherited. They said she wasn’t very quotable like I am. Beautiful frame. Beautiful cat and gorgeous frame!! You look very nice with your autumn frame ! We still hope the summer would last forever ! 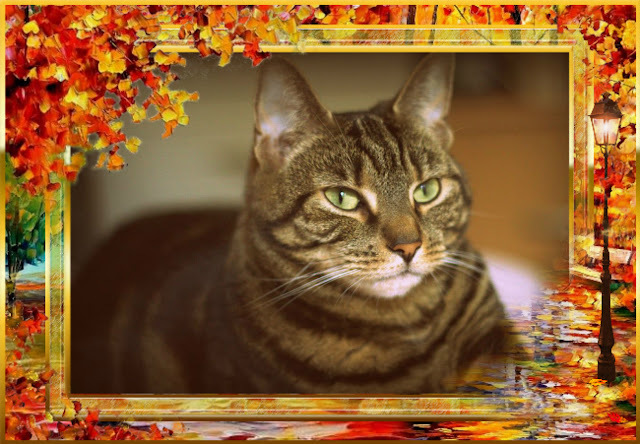 Love your autumn cat! So perfectly timed too! I love autumn too! That is such a pretty frame and Athena looks so lovely! Your photo is like a still art! So beautiful, as always Athena. Your photo is beautiful Athena and I love the frame too. We love that photo and frame. Great job, Athena! You're so artistic. Autumn is my mom-persons favourite season too , she loves when she can pick Blackberries and all the colors on the leafes. That is absolutely gorgeous. Autumn is my favorite time of year, too. I wish it could last forever!!! As always Athena, your Mommy has done a fabulishious job! You always have such pawsome artwork!! Meowllo bootyful Athena. Weez membered to link up on our bloggy but we furgot to link up here. MOL Ifin it's not one fing it's anuvver wiff mommy. Oh well, have a pawsum weekend. I don't have a favorite autumn quote, but autumn is my favorite season! My birthday is in autumn!! !